Dog lovers unite! Chewy has everything you need for your lovable pup all available at the click of a mouse. Spoil your puppy with only the best in dog supplies for dog food, dog treats and dog toys. If you've been searching for cod flavor dog food, look no further. Among the wide selection we carry, one option to try is Annamaet Grain-Free Sustain Formula Dry Dog Food. Key benefit: grain-free and non GMO so it's great for dogs with food allergies and those pups that are health conscious. 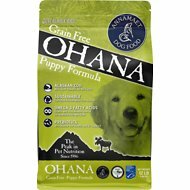 Another product is Annamaet Grain-Free Ohana Puppy Formula Dry Dog Food. Key benefit: marigold petal extract provides a great source of lutein to help support the immune system. Whatever it is you're looking for, Chewy has got you covered. Shop our wide selection of dog supplies today and treat your furry friend to a box of new goodies. For all your pet needs including cod flavor dog food, Chewy has you covered! We're here for you.